I have an apex alarm set to go off if the PH ever drops below 7.9. I'm looking back through alarm history and the low PH alarm has not triggered in the last three months that I examined. I do know that the nighttime low did get down to like 7.95 for a night as the Ca reactor came up to speed, but that was one night and the rest stayed about 8.0. Temperature-wise, I think the only way I'll drop any temp is to add a chiller. I have been looking into them something fierce since this raised its ugly head. I was thinking a 1/5 HP might be good enough. What would other's thoughts be? Definitely planning for a AC change back to the two week mark I used to run at. Reality is that in the year I did it that way, I never had an issue. For the water changes, it has been the same bag of salt for the past 4 water changes. I use the Red Sea Coral Pro in the contractor bag that does 200gal of water. I have used the same salt mix for almost a year now. I'm thinking the ph drop and a kh drop added a little more stress than they could handle. AC has never been a big issue for me so I doubt it's that. Red sea salt has been an issue in the past but the last few years I haven't heard of any issues with it so it's a small possibility, but not likely. In leu of the chiller, you can try fans. Cheaper to buy and cheaper to run, the only issue is evaporation is higher. The can drop the temp by a few degrees and can be run off your apex. To be frank, there are still more questions, which if answered in the affirmative could have been the reason for this coral deterioration. There are many ways to avoid the expense and trouble of some of the maintenance activities that may seem so essential to newer hobbyists. I think what happens is that a hobbyist decides what they think should work and if it does work, they then hesitate to change the formula. That's perfectly normal since it follows the old adage "if it's not broke, don't fix it." 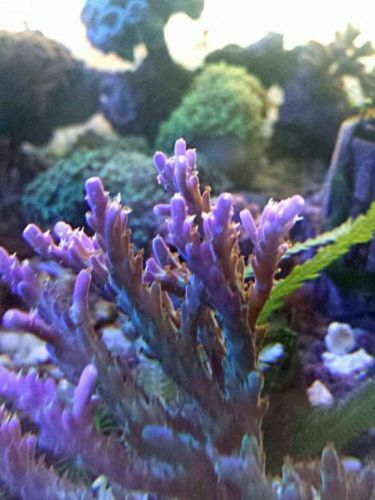 As a hobbyist sets up more and more aquariums, spends extended time in the hobby, listens to the experts (who sometimes disagree on some of the most basic matters), the more that hobbyist comes to realize that a beautiful reef can be grown in lots of different ways. PH is sitting at 8.12 at night with lights off and 8.21 during the day. I canned all the hanna checkers and have been testing with Red Sea and Salifert on each of the tests. You SHOULD have hollered at me, there was nothing fun in Seattle, was just there for the day for business so seeing a friend would have been much better LOL. I was probably lost in my own world there. I am always nervous of the checkers. Next time I see you, I will say hi. I'm pretty nervous on flights anyway, a drink and Xanax is what gets me through it. Ha. That is one of the reasons I get anxious! Haha! I get uncomfortable when the something I am sitting in is bending at 30k feet in the air. Oh I realize that. That's the crazy part. Its all in my head. I fly a dozen roundtrip flights a year and still freak out. Thankfully, Xanax works. But I digress. Sorry to mess up this thread! Don't worry Marcoss! You didn't mess it up. I need to come by and see you! After much consultation with Mark Peterson, I am continuing the plan of doing very little other than keeping the carbon fresh, feeding the tank more, and keeping those numbers on the alk and ph from ranging too far. The tank has begun to bounce back quite a bit and it is getting tested morning and evening to make sure the main thing it is getting is stability. I think the worst may be past, but am crossing my fingers! 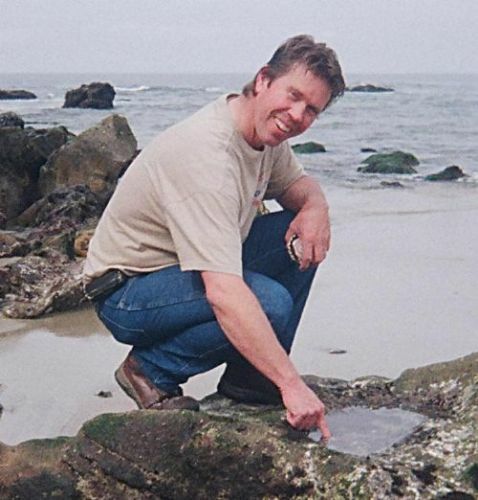 Really enjoyed visiting with you and sharing what I have learned as it relates to your reef. As you begin to feed more, watch how things are doing and consider running the skimmer more often. 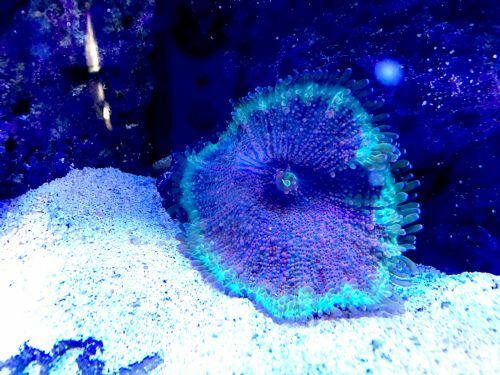 With all those fish and the desire to grow lots of SPS coral, a skimmer is a necessity. Remember to contact Brad Syphus, another Murray resident, and go see his SPS dominant tank, ask how he feeds and what filters the water. 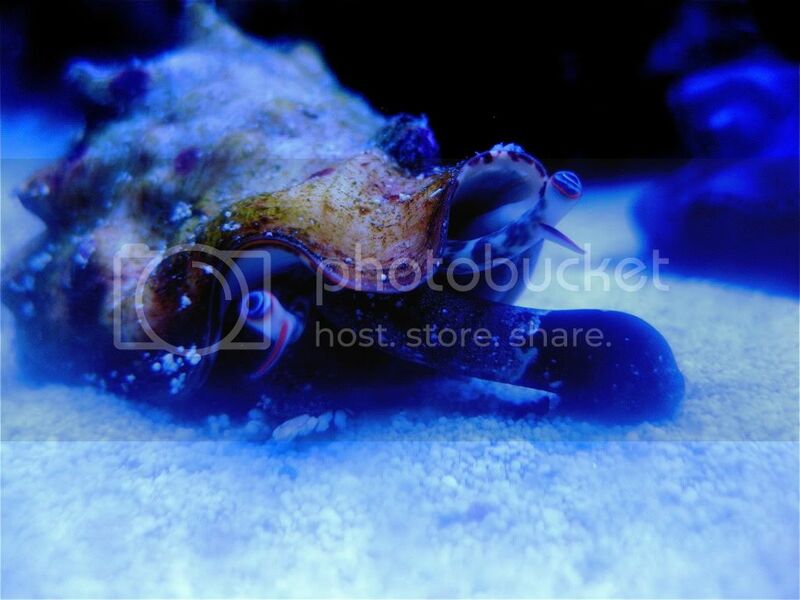 A pic of a part of his tank is below. 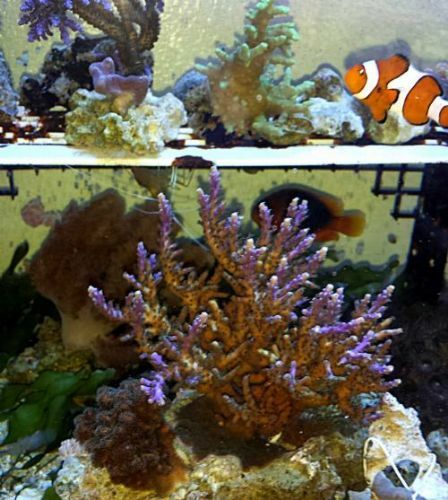 Also see the pic of Tricolor SPS from my 230 gal coral farm system that used a skimmer rated for 75 gals. 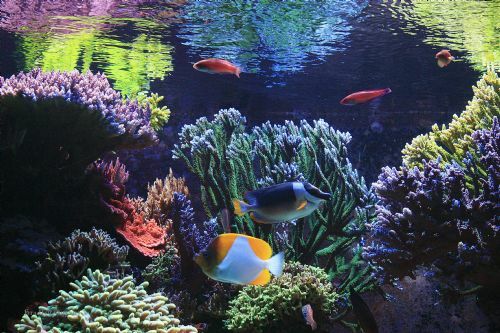 Once a day feeding has been sufficient for most aquariums, except, where there are Anthias more frequent feeding are required. As far as feeding, skipping a day a week, yet doubling the feeding on occasion gives the fish an opportunity to feast and then fast. In my experience that promotes healthy animals and healthy biofiltration. It's great that you enjoy testing. You may eventually find that weekly or biweekly testing gives sufficient data to "check the pulse" of the Calcium Reactor. It might not hurt for me to mention again for all readers; perfectly stable parameters can create a situation where the tank can seriously stress when something changes by just a fraction. Instead, strive to keep parameters in range and trending toward the equilibrium of the tank. Each tank will have it's own equilibrium and the equilibrium of a single tank will change as it matures. Yes you do! By the way, do you still have that pink and blue mushroom? I brought in hundreds last week, and I do not have anything that cool! How is your tank doing? Time flies inside of our little boxes of water. Maybe it's not water at all, maybe you have aef? I ditched RSCP salt a couple years back after a bucket I had was testing 14 dkh - it was causing tons of problems when I did a water change, in terms of alk swings. Oh, do you mean this one Marcoss? :-) Still no babies, but happy as can be. Have tried daytime and nighttime identification of flatworms, Tink. Nothing showing, even when I dipped one of the corals that was worst off. 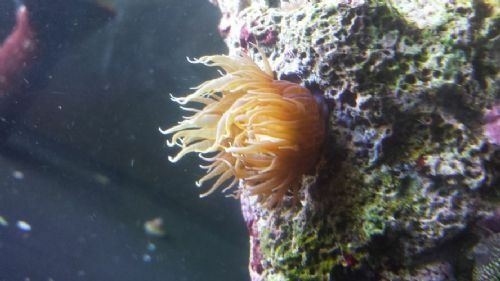 General update is that the die off has stopped and most of the corals have re-grown tissue. Some that I thought were 100% lost, like the sunrise monti and the setosa, both have recovered and look about the same as before. In the end, I believe higher frequency carbon change and stabilizing the calc reactor were the biggest factors in stopping the carnage. Have just been super focused on stability for the last two weeks and it has delivered marvelously. I knew it was important, but now I know just how critical stability is. I do test all my water change salt when I mix the first batch from a new bag or bucket. Red Sea has always been perfect for me, but it stands to reason that anybody can have a processing issue, therefore I test each new batch of salt. Thanks all, have loved all the help that came to the rescue here. Sincerely appreciate you as well, Mark, for coming over and sitting in front of it and scratching your head with me :-) Was great to get such a straight forward perspective and benefit from your years of seeing it all!